Preheat the oven to 190°C/gas mark 5. Lightly grease a 20cm round shallow cake tin with olive oil. To make your pesto, put all the ingredients in a blender and blitz to form a coarse paste. To make the buns, mix the flours, sugar and baking powder together in a large bowl. Rub in the butter with your fingertips, then stir in the milk and mix to form a soft dough. Knead the dough on a lightly floured work surface for a few minutes, until smooth. Roll out the dough to make one large rectangle. 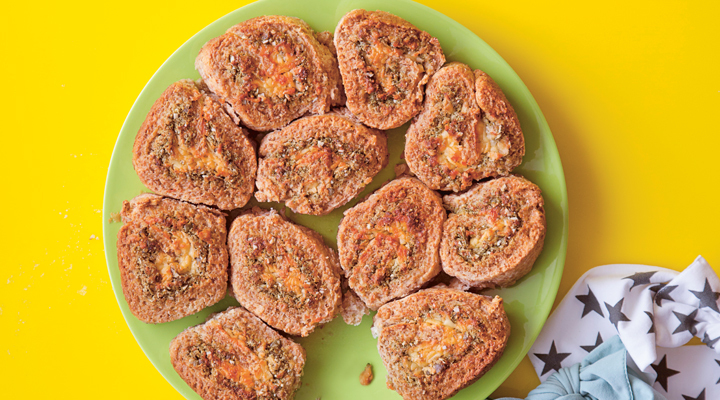 Spread the pesto over the dough and sprinkle the grated Cheddar cheese on top. Roll up the dough like a Swiss roll. Cut into 12 slices and put in the greased cake tin in a single layer, swirl side up, so they are touching each other. Brush with the beaten egg. Bake in the oven for 30 to 35 minutes, until golden brown.